It is in a great location. Just 5 mins walk from the beach. Elaine is one of the nicest hosts I have ever come across. She went above and beyond to make sure we were comfortable at all times. I was in Rhodes for my wedding and she personally made up a bottle of wine and treats for me and my wife as a gift. On our last night Elaine and her friend Ponagiotis shared a bottle of wine with us. Ponagiotis also had early helped drive me for free to a friend's location in a small village at 1am. He was a very kind soul much like Elaine. Overall the companionship, help, and stories that Elaine and Ponagiotis shared was one of our more memorable travel moments our lives. This was a great experience. Our two bedroom apartment was very nice and very clean. It was equipped with small kitchen where you could cook or prepare a coffee. There was AC and bottle of water in the fridge upon arrival. The beach was three minutes walking distance. There are also supermarkets and restaurants in walking distance. Eleni was a lovely host. We had a very good stay at Vlycha Beach! Eleni was a very warm and kindly host! It is a perfect place to relax! I would recommend this accomodation! Thanks again Eleni, we had a wonderful time!! Hostest Eleni (& her dog, Roxy) were delightful. The Apartment/Studio was virtually brand new. Very comfortable. Very pleasant patio area to sit out on. Handiness & closeness to beach, and beach taverna a minutes walk away was good. 2 TV's were available - one in the living room and one in the bedroom. All Greek channels however- BBC World Servce could be added on TV perhaps, although a couple of channels did run films in English with Greek subtitles so, was still useful in that sense. didn't visit Greece to watch TV, but was a good additional feature when required. Air con was very welcome too. The host was very friendly, she asked us every day if everything was perfect. There is a possibility to transfer to the airport for very low price. The beach is just in 5 min by walking. Cleaning service every two days. Eleni was an absolutely amazing host, she was so welcoming and friendly and went above and beyond to make us feel welcome. The area and the rent a car facilities staff Angel was lovely as well. If we needed a taxi or any information he would help us. Unbelievably friendly. Overall an amazing holiday and we will be back. Eleni was a perfect host, kind and approachable. The location is perfect if you want to visit the east coast beaches (which are the most beautiful). There is pretty much nothing around so the car is highly recommended. The flat was bigger than what we thought and it was cleaned almost every day. Fresh sheets and towels were provided daily. Lock in a great price for Vlycha Beach Apartments – rated 8.8 by recent guests! Just 800 feet from the sandy beach of Vlycha, Vlycha Beach Apartments offer accommodations set in a spacious garden. The beach is equipped with sun beds, umbrellas and there are water sports facilities. Free WiFi is available in all areas. The air-conditioned studios and apartments at Vlycha Beach are bright and comfortable. Each has a spacious balcony with sea or garden view, kitchenette with fridge and satellite TV. A safety deposit box is included. Car and bicycle rental services are featured. Guests can find the village of Lindos with the ancient Acropolis, only a 5-minute drive away. The famous Butterfly Valley is at 37 mi. Taverns serving Greek cuisine and a mini market are within short walking distance. The taxi station is 350 feet away and the bus stop can be found in less than 1,650 feet away. The Port of Rhodes and Rhodes Airport are both approximately 28 mi away. When would you like to stay at Vlycha Beach Apartments? 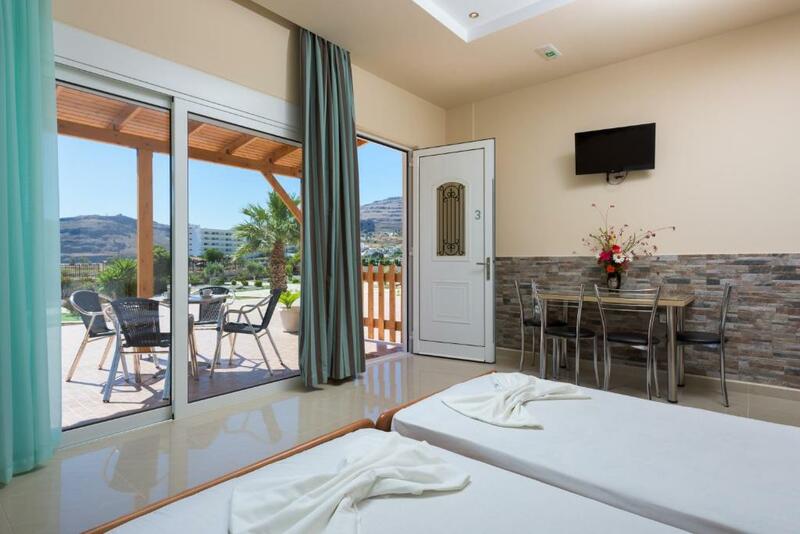 Each with a balcony with sea or garden view, these studios include a kitchenette with fridge and satellite TV. Free WiFi is provided. Please note that the view is subject to availability. Each with a balcony with sea or garden view, these apartments include a kitchenette with fridge and satellite TV. Free WiFi is provided. Please note that the second bedroom is located on an attic and is accessible by stairs. This apartment features air conditioning, stovetop and electric kettle. Free WiFi is provided. Vlycha Beach Studios and Appartments are located in one of the most beautiful and attractive beaches of the island. Our studios and apartments invite you for an unforgettable vacation in the diamond of the Dodecanese islands, Rhodes. Our facilities are in the middle of a big and amazing garden and provide full kitchenette (with fridge), free internet access, safe box, aircodition, satelate tv and private parking. Each one has huge balconies with sea or garden view. Just 250 meters from the crystal and sandy captivating sea of Vlycha Beach (3minutes walkaway), we offer a unique combination of calm and peaceful relaxation away from the city noise, autonomous and entertaining. In the same area with the studios and apartments there is a rent a car service. Further down you will find the taxi station (about 100 metres away) and the bus stop. In a small distance away there are restaurants where you can enjoy the traditional Greek and traditional cuisine.The charming village of Lindos with the ancient Acropolis overlooking the small white traditional houses is just 5 minute away from Vlycha beach awaiting your arrival. Is there any other place you would rather be? House Rules Vlycha Beach Apartments takes special requests – add in the next step! Vlycha Beach Apartments accepts these cards and reserves the right to temporarily hold an amount prior to arrival. Please note that change of linens and cleaning service is provided every 3 days. Please inform Vlycha Beach Apartments of your expected arrival time in advance. You can use the Special Requests box when booking, or contact the property directly using the contact details in your confirmation. Some additional washing up stuff, like Washing up liquid & brush/scourer etc may have been provided - -not complaints, but just additional things that could have improved the stay. The view, the host, the location and the price. U have to go to the supermarket on the mountain, but it was good sport for me ! We did not like at all...Vlycha Beach...which is a rather acceptable pebble beach with some facilities...a spacious parking ground, some apartment buildings behind and a huge construction site with heavy lorry traffic. The host was amazing! So welcoming, lovely and attentive! The apartment was clean, with air conditioning. It is just a 2 minute walk to the beach, which is great. It was never too crowded and the water is beautifully clear, and there is a bar/cafe on the beach which is really convenient. There are 2 restaurants within walking distance of the apartment, both excellent.